Underpads also known as Chux are rectangular absorbent pads designed to protect your bed and chairs and come in a variety of sizes and styles. Waterproof Sheeting is a latex free waterproof sheet that wraps around the entire mattress and secures firmly with built in elastic straps, keeping it dry. Breeyo Underpads are made of the highest quality materials and are the most absorbent on the market today. These pads will not leak or tear when you pick them up. Dryness enhanced top sheet combined with our poly filled diamond embossing improves overall wicking of fluids throughout the pad for improved absorbency. Wicking fluid away from the point of entry moves fluid over a larger area, creating a drier surface promoting healthy skin. Polypropylene backing offers maximum back-up protection for beds and chairs, while our aggressive adhesive strips on the bottom of the pads will keep them in place. Ideal Underpads are designed with waterproof backing and extra fluff. Ideal Underpads also contain Super Absorbent material for extra liquid retention at a more rapid pace. 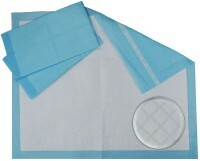 They have a soft, cloth-like topsheet that covers the entire surface to promote healthy skin. Super absorbent polymer locks fluids away from skin and helps prevent odor. It also features tape to eliminate pad movement and bunching. Leak-proof backsheet protects surfaces from fluid. 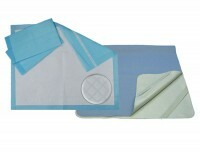 Our Waterproof Sheeting is the perfect reusable underpad for any home or institutional care use. Made of heavy-absorbent needle-punched soaker material and featuring antimicrobial construction, our reusable Waterproof Sheeting will hold up wash after wash to provide you with months of use.